When you borrow, you are accepting the responsibility of repaying the loan plus interest. It is your responsibility to know all of the terms and conditions of your loan. You must keep the lender informed of any of the following changes: withdrawal from school, transfer to another school, drop below six (6) credit hours per term, or any changes to name, address, or social security number of student or parent. You are expected to know what options and responsibilities you have regarding repayment. This includes when you start repayment, what kind of loan(s) you have, and what options exist concerning consolidation, deferment, and forbearance. Failure to repay a loan will cause you serious consequences, which may include ineligibility for other financial aid, withholding of tax refunds by the Internal Revenue Service, difficulty in obtaining credit, and wage garnishment. You should carefully review your situation before you borrow. Consideration should be given to other sources of funding prior to accepting a loan. You need to calculate exactly how much loan is necessary to meet your educational needs and review your repayment obligations thoroughly before incurring added debt. Borrower limits for Federal Loans are based on grade level and dependency status. A student may borrow between $5,500 to $10,500 per year in Direct Subsidized Loans and Direct Unsubsidized Loans depending on certain factors, including your year in college. Only half of the annual limit can be requested in any one semester. Currently, there is a 3.76% fixed interest rate charged to all new Subsidized and Unsubsidized loans first disbursed between July 1, 2016 and June 30, 2017. In addition, there are loan fees in the amount of 1.068% for Subsidized and Unsubsidized Loans and 4.272% for PLUS Loans disbursed on or after October 1, 2015. This means the money you receive will be less than the amount you actually borrowed. You are responsible for repaying the entire amount you borrowed and not just the amount you received. For loans disbursed on or after October 1, 2016 and before October 1, 2017, the loan fee is 1.069% for Subsidized and Unsubsidized loans and 4.276% for PLUS loans. For more detailed information about student loan interest rates and fees visit the Federal Student Aid website. ACC participates in the programs listed below. Interest rates on these loans are set annually. For more information on interest rates, contact the Financial Aid Office. There are two types of Federal Direct Loans. Federal Direct Subsidized Loans are based on a student’s financial need unmet by other financial aid. Federal Direct Unsubsidized Loans are used to replace the family contribution. For a Federal Direct Subsidized loan, the federal government pays the interest on the loan while the student is attending college at least half-time (6 credit hours) or in a grace period for up to six months after the student leaves college. If a student receives a Federal Direct Unsubsidized Loan, the student has the option to either pay the accruing interest quarterly, or to have it capitalized at the point repayment begins. This loan is for the parents of dependent students. The parent(s) may borrow up to the cost of education less any estimated financial aid the student will receive. The Federal Direct Plus Loan is credit based and requires a credit approval. Applying for loans begins with completing the Free Application for Federal Student Aid (FAFSA) at www.fafsa.gov. Once that process is complete, the Financial Aid Office will send an Award Letter to your ACC student email account, which will include a loan offer alongside of any other eligible federal aid. Students must accept the loan offer, of which the amount can be decreased prior to accepting, if necessary. First-time ACC borrowers must also complete the additional application documents listed below. First-time ACC borrowers must also complete the following documents before an accepted loan can be disbursed. Entrance Counseling is required before you can receive your first Direct Subsidized or Unsubsidized Loan as an undergraduate student. Entrance Counseling explains the obligations you agree to meet as a condition of receiving a Direct Loan. To complete Entrance Counseling, you will need your Federal Student Aid ID (FSA ID). Sign in to studentloans.gov and select the “Complete Counseling” option found in the left navigation bar. Then select “Entrance Counseling” under “Choose Counseling Type”. The Master Promissory Note (MPN) is a legal document in which you promise to repay your loan(s) and any accrued interest and fees to the U.S. Department of Education. It also explains the terms and conditions of your loan(s). For instance, it will include information on how interest is calculated and which deferment and cancellation provisions may be available to you. There are two types of MPNs in the Direct Loan Program: one for Direct Subsidized/Unsubsidized Loans and one for Direct PLUS Loans. A single MPN is valid for up to 10 years. To complete an MPN online, you will need your Federal Student Aid ID (FSA ID). If you are a parent completing a Direct PLUS Loan MPN online, you must use your own PIN and not your child's PIN. Sign in to studentloans.gov and select the “Complete Direct Subsidized/Unsubsidized Loan Master Promissory Note (MPN)” option found in the left navigation bar. The entire MPN process must be completed in a single session, so be sure you have enough time before you start. Each MPN takes approximately 30 minutes to complete. Enter your personal and school information. Enter information about your references (people who have known you for at least three years). Review, electronically sign, and submit the MPN. To request an increase to your initial loan amount offer, please complete a Direct Loan Increase Request form and submit to the Financial Aid Office. Student loan funds borrowed through The William D. Ford Federal Direct Loan Program are sent electronically to ACC and paid to student accounts. No loan(s) will be released prior to scheduled disbursement dates for any reason. First-time borrower loan disbursements are made 30 days after the beginning of the term. Any loan funds remaining after the tuition and fee balance has been paid in full, will be disbursed to the student via the method chosen by the student (i.e. automatic deposit into your banking institution, BankMobile, or a mailed paper check) within 14 days. Students have the right to cancel a loan disbursement within 14 days of disbursement by completing a Cancellation/Reduction of Aid Request form. Remember, you must repay a student loan even if your financial circumstances become difficult. Your student loans cannot be canceled because you didn’t get the education or job you expected, or because you didn’t complete your education. Exit Counseling is required when you graduate, leave school, or drop below half-time enrollment. Exit counseling provides important information to prepare you for repayment of your federal student loans. To complete Exit Counseling sign in to studentloans.gov and select the “Complete Counseling” option found in the left navigation bar then select “Exit Counseling” under “Choose Counseling Type”. You will make payments to your loan servicer. Each servicer has its own payment process, so check with your servicer if you aren’t sure how or when to make a payment. If you don’t know the loan servicer for your loan(s), you can find that information by logging in to the National Student Loan Data System: NSLDS.ed.gov. You have a choice of several repayment plans. Consider changing to a different repayment plan that better meets your needs. The amount you pay and the length of time you’ll have to repay your loans will vary depending on the repayment plan you choose. Please note that choosing a repayment plan with a lower monthly payment means that you'll pay more in interest over time. 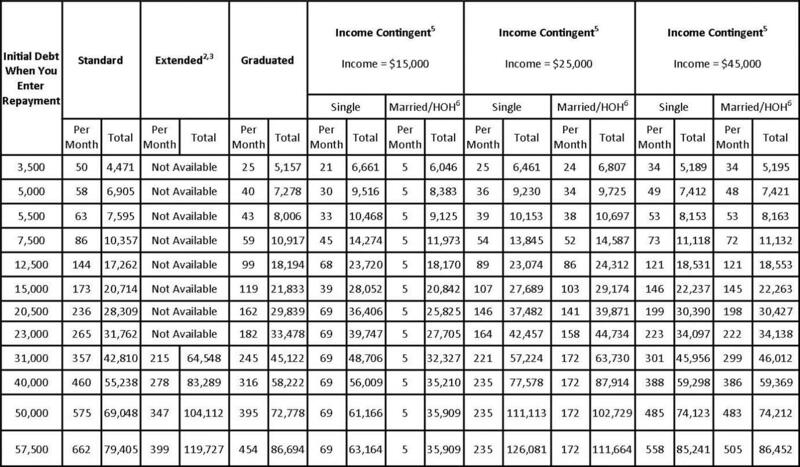 Some of the details on the different repayment plans are provided in the table below. For details on the various repayment plan options check the Federal Student Aid website.